By Prof Paula Giliker, Professor of Comparative Law (University of Bristol Law School). October 2017 marked the publication of the Edward Elgar Research Handbook on EU Tort Law. 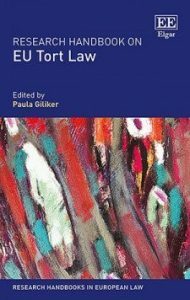 This is part of the series of Research Handbooks in European Law published by leading Law publishing house, Edward Elgar, which offer authoritative reference points for academics, students, and practitioners studying or working in EU law, private law and comparative law. The aim is to be comprehensive and informative, but also accessible for those approaching the subject for the first time. The Research Handbook on EU Tort Law is edited by University of Bristol Professor of Comparative Law, Paula Giliker, but also contains contributions from other Bristol academic staff including Dr Jule Mulder, Dr Albert Sanchez-Graells and Professor Keith Stanton, together with 14 other contributions ranging from the UK and Ireland to France, Germany, the Netherlands and Hungary. This truly international project seeks to examine the extent to which EU-sourced law (directives, judicial decisions, regulations, Treaty provisions) have created new rights in the law of tort on which claimants can rely in either the Court of Justice of the European Union (CJEU) or national courts.